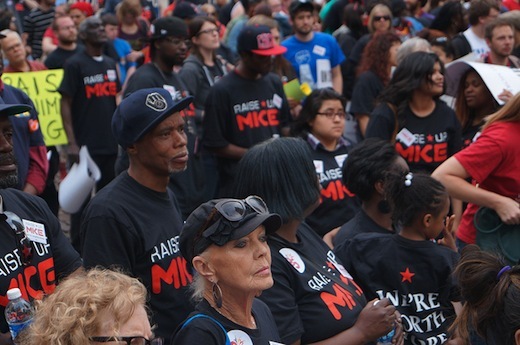 Taking their cue from workers in St. Louis, Chicago, New York and Detroit, fast food workers took to the streets of Milwaukee on Wednesday in a one-day work stoppage to demand a $15.00 an hour wage. Workers came from behind the cash registers and out of the kitchens of such flagship fast food companies as McDonald’s, Burger King and Wendy’s. 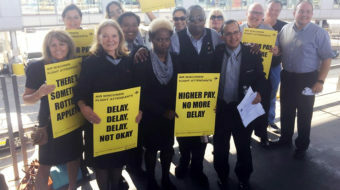 Low wage retailers such as Simply Fashion and Foot Action also saw their employees walk out in unity to demand the right to form a union without fear of retaliation. Union and community groups stood with the workers in their demand for a living wage. The protest comes on the heels of a shocking report released in April that revealed Wisconsin to have the highest rate of incarcerated African American males in the nation. Low wage jobs, such as fast food and discount retail, remain the only option for many of those struggling to feed their families. Photo: Milwaukee fast food workers in this 2012 photo demonstrate for higher wages (Light Brigading/CC).